The new CF-Quad is equipped with an integrated 105 Watt Compact Fluorescent Quad Lamp and state of the art Electronic Ballast for high intensity light output with low energy consumption. The 28G CF-QUAD definitely is the most value packed all-in-one in its class and price level. 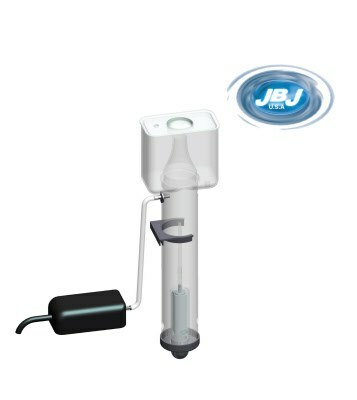 It offers almost 50% more light output than competing CF brands, 2 Powerheads, Ocean Pulse Duo Wavemaker, removable transparent filter basket (for easy Refugium conversions), designated Heater column, designated Protein Skimmer (sold separately), 2 Cooling Fans, and 4 Nite-Vu LED’s with their own power supply. The revolutionary CF-QUAD powercompact boasts 105 watts of high intensity daylight light output with our 10K/7100K combo compact fluorescent lamp. 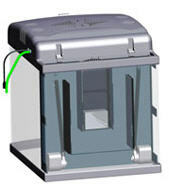 It utilizes a very compact size while delivering MEGA lumens to your corals. The quick-disconnect harness makes changing the lamp quick & easy. 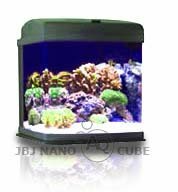 Nite-Vu LED’s are strategically placed on all four corners to evenly distribute moonlight throughout the aquarium. 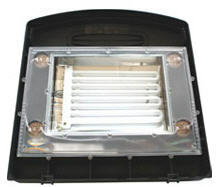 All LED’s are pre-wired individually for easy replacement, consume less than 1 Watt of power, but are strong enough to illuminate nocturnal behaviors. Stand is not included in purchase price.